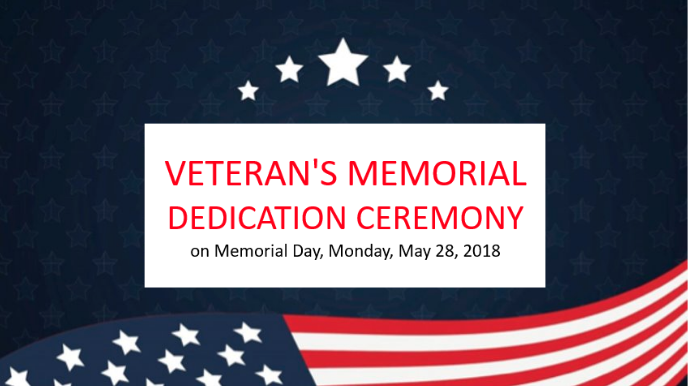 On Monday, May 28, 2018 at McLendon-Chisholm Hall we will have a dedication ceremony from 9:30am to 11am. Enjoy refreshments provided by the Girl Scouts of America Troop #8967. Our City of McLendon-Chisholm is receiving a monument from the Rock Wall Chapter DAR. It will be a place for us to not only reflect, but honor those who have served our country in Rockwall County. This installation is meant to honor the male and female veterans of the past and present, as well as comfort and inspire their family members. For our beloved veterans we hope you and your family attend so that we may pay tribute to your courage and sacrifice that you have made for our country. Rock Wall Chapter, National Society Daughters of the American Revolution, Advance the Colors by the East Fork Trinity Chapter SAR, Girl Scouts of America Troop #8967, CTNA Pyro, Rockwall County dignitaries and Senator Bob Hall will be taking part in the ceremony. This monument will always be there as a symbol of respect for those that have always been there to protect us and the United States of America. 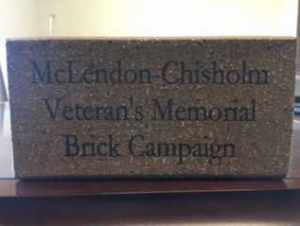 There is a brick campaign provided by Fundraiser Brick that will be a simple online application to have an engraved brick to be added to the memorial. The cost is $150 per brick and you may customize it. Orders will be produced at bulk amounts of 50 to 100 and will be installed on site. For those who do not have access to a computer our City Secretary may be able to further assist you. This will be a tax deductible item and a letter will be provided. Please do share with your friends, neighbors and anyone that lives in Rockwall County that has served or is serving in any military branch to attend.